When she was just eight years old, Ilana Kleynerman’s entrepreneurial curiosity was piqued by hermit crabs. On vacation with her family, Ilana saw tourists buying the souvenir pets for $5. But rather than begging her parents for one, she realized there was nothing stopping her from doing the same thing—and so, back at home, she started collecting her own hermit crabs and selling them for $2. That go-getting attitude started early and never left. “I was definitely one of those kids who liked to stay busy and productive,” she said. When Ilana was in eighth grade, a school project posed the question of how to give back to the community. In response, Ilana created an obesity awareness program for students, which still exists today. She has continued keeping busy and giving back ever since, contributing more than 11,000 volunteer hours at her high school and in her community. 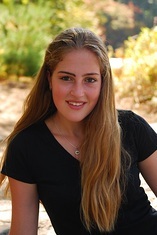 As a result, Scholarship America is proud to announce that Ilana Kleynerman is our 2015 National Student Volunteer of the Year. Ilana credits her small, tight-knit hometown of Sudbury, Massachusetts, as being a place where her many interests could flourish. “It’s one of the biggest advantages,” she noted about having smaller-sized classes at Lincoln-Sudbury Regional High School. Her instructors weren’t just teachers—they were mentors as well. Ilana’s academics and activities took off in this supportive environment. She participated in and led numerous extracurriculars, including entrepreneurship and business clubs; speech and debate team; varsity soccer and track and field; and host and anchor at her local television station. She also created her own TV show for the channel, documenting clubs and activities at her high school. She interviewed and filmed people at school- and community-sponsored events, which further fueled her desire to be involved in community life. When Ilana’s family first arrived in the United States, all of these achievements seemed to be worlds away. As the child of first-generation Russian immigrants, “starting over was not easy for [my parents],” she said. But their sacrifices for Ilana and her two sisters constantly inspired Ilana to thrive. Seeing the challenges her parents faced, she said, strengthened her own resolve to overcome obstacles—including working at a local café, and as a soccer referee and nanny, to help pay for college. “I would be the one to finance my education,” Ilana said. Without the luxury of having additional college money, she worked hard to save money and apply for scholarships, knowing that they would be crucial to her future. Her family also instilled a sense of community service, even at a young age. Ilana’s Russian language ability, for example, enabled her to translate conversations between Russian-speaking patients and their caregivers at the Hebrew Rehabilitation Center. It was one of many selfless endeavors that are now paying off for Ilana. “Receiving the scholarship just validates the fact that I was hoping to help and inspire others,” she said. Her local Dollars for Scholars® affiliate, Lincoln-Sudbury Scholarship Fund Dollars for Scholars, readily nominated her for the award; she had previously received scholarships through the affiliate. “Whether Ilana is engaged in academics, volunteering or in entrepreneurial pursuits, [she] puts 100 percent into her efforts,” said Leanne Cordischi, Executive Director of Lincoln-Sudbury Scholarship Fund Dollars for Scholars. It wasn’t the first time the affiliate’s students had been recognized nationally: Last year’s National Student Volunteer of the Year, Helen Montie, was also nominated by Lincoln-Sudbury Scholarship Fund Dollars for Scholars. “We could not be any prouder of our chapter and our students,” Leanne said. Scholarship America’s Dollars for Scholars Student Volunteer Award (SVA) provides special recognition and a scholarship award to students who embody the volunteer spirit of Dollars for Scholars. Selected recipients receive a $1,000 scholarship award, with one national award winner able to renew the award for up to three years for a total of $4,000. See the other SVA recipients here!